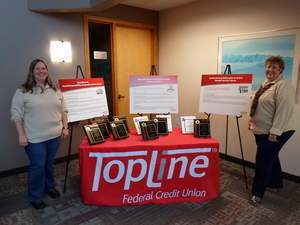 MAPLE GROVE, MN--(Marketwire - Oct 26, 2012) - The employees of TopLine Federal Credit Union took home three of the four statewide community service awards in TopLine's asset class from the Minnesota Credit Union Network (MnCUN) and the Credit Union National Association (CUNA). The awards represent the highest honors for community service that the Minnesota Credit Union Network bestows upon its member organizations. TopLine's awards include the Louise Herring Philosophy in Action Member Service Award, the Desjardins Youth Financial Education Award and the Desjardins Adult Financial Education Award. TopLine will now advance to national competition in late September, where it will compete with other credit unions from across the United States for additional recognition from the Credit Union National Association (CUNA). The Louise Herring Philosophy in Action Member Service Award is awarded for the practical application of the "people helping people" credit union cooperative philosophy. This year's Louise Herring award recognizes TopLine's commitment to services such as its unique Member Mortgage Relief Committee, which helps members struggling with their mortgages to stay in their homes; partnership with LSS Financial Counseling Service to provide free counseling services to help members proactively deal with stressful financial circumstances; for efforts in standing ready to assist members of the military and their families; and recognizes TopLine's product innovations like "Sum-It-Up Savings," that encourages thrift among its members. The Desjardins Youth and Adult Financial Education Awards recognize the leadership of individual credit unions to better educate youths and adults in financial literacy. TopLine's two Desjardins awards recognize the credit union's wide range of educational seminars and school and college class presentations to local educational institutions as well as to area Rotary Clubs and Chambers of Commerce. "It's energizing to be recognized by our peers for our TopLine culture of community service," said Harry Carter, TopLine's President and CEO. "Personal, caring service is certainly one of the things that really distinguishes all credit unions, and it's the service we know makes a real difference in the lives of our members and others in our community." TopLine has won at least one of the four competitions each year since 2005 -- for a total of five Dora Maxwell Awards, which recognize credit unions for charitable community activities, four Desjardins Awards and two Louise Herring Awards. The Minnesota Credit Union Network (MnCUN) is an organization representing the state's 137 not-for-profit cooperative credit unions, serving more than 1.5 million member-owners in Minnesota. For more, visit www.mncun.org. TopLine Federal Credit Union, a Twin Cities-based credit union, is Minnesota's 13th largest, with assets of more than $320 million. Established in 1935, the not-for-profit cooperative offers a complete line of financial services from its five locations -- in Bloomington, Brooklyn Park, Maple Grove, Plymouth and in St. Paul's Como Park -- as well as by phone and online at www.TopLinecu.com. Membership is available to anyone who lives, works, worships, attends school or volunteers in Anoka, Carver, Dakota, Hennepin, Ramsey, Scott or Washington Counties and their immediate family members. TopLine employees win three out of four honors from the Minnesota Credit Union Network for outstanding community service. Pictured: Amy Klein and Nancy Seitz.